Over the last few years, one of the most interesting types of visual trickery to emerge has become almost a fixture in the public art world. The idea is that from a particular location, a three dimensional illusion is constructed that exists only when the viewer is standing in that one spot. A single step away to either side breaks the perspective and the illusion is gone, leaving only a strange collection of disconnected shapes that don't seem to form anything at all. Street art is many things, but it is rarely grandiose in scope. The nature of the social climate in which it's painted - that is to say, secretly, illegally, and usually in the dead of night - makes it difficult if not impossible to work on a scale larger than a single wall canvas. This massive mural, located in Cairo, is a perfect example of how the two techniques can be blended together to create something truly staggering. The brainchild of a French-Tunisian street artist who goes by the name eL Seed, the piece is actually composed of a staggering number of individual pieces that, when taken singly, amount to virtually nothing. 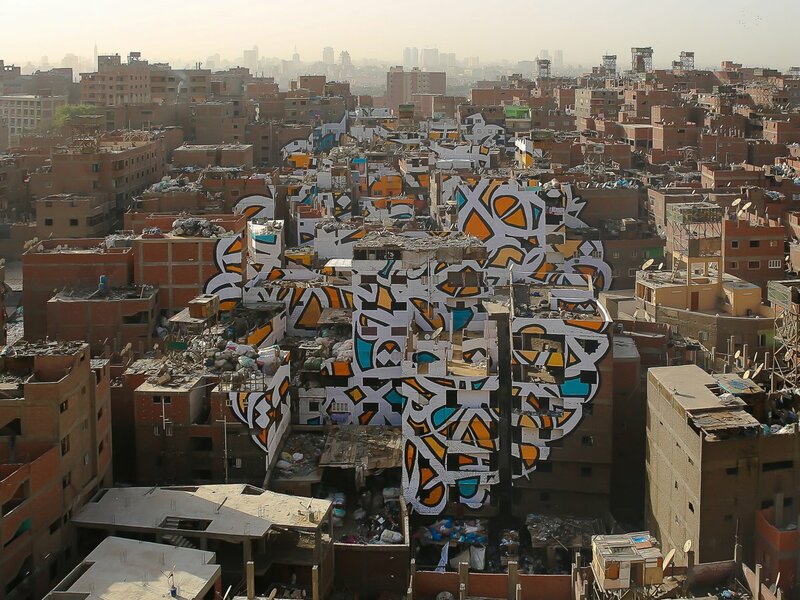 Standing atop a nearby hill, however, the pieces click together into a giant piece of so-called 'calligraffiti' in Arabic, which says: "If one wants to see the light of the sun, he must wipe his eyes." Due to the extremely repressive government currently in power in Egypt, the development and construction of the piece had to be completed in total secrecy from the government. Current Egyptian law prohibits public artist expression, as it is no doubt likely to inflame a populace that is already in a state of near-constant turmoil after the Arab Spring uprising that started in Egypt several years ago. Fortunately for us, eL Seed and his collaborators documented the entire process, from planning to execution to the final reveal. While the piece was kept secret from the powers that be, the rest of those involved were aware of the intentions. "We got the blessing of the priest," he says. "He gave us permission and everyone in the neighborhood knew about it." The piece is ambitious, daring, and unique among street art, and it's an incredible example of what can be accomplished under even the most difficult conditions. Sometimes out of the worst situations, the most amazing creations emerge.